As I have mentioned in other reviews here, one of the most difficult aspects of writing a blog like this is writing about artists who are so little-known that no one else has written about them. That is the situation I find myself in with this week’s subject, Gene Stone. He is perhaps one of the least-known drummers working in jazz today. Popularity and name familiarity are not, however, accurate indicators of skill, as I have also mentioned before. There are very popular artists out there who, frankly, stink. Gene Stone does not fall into the “stinker” category. A search of allaboutjazz.com for biographical information about Stone brought back ten pages of links… Unfortunately, they were all either links to articles about other musicians, with perhaps a casual reference to Stone, or referred to other musicians with the same first or last name. When I re-ran the search on allmusic.com, it brought up two artists named Gene Stone. The information given about each was minimal, but enough to discern that neither gentleman is the Gene Stone about whom I want to tell you. So what is about to happen is, I am going to share with you what little information is available. My sources are the liner notes from this week’s album (which were written by Zan Stewart), and Gene’s THREE pages on Facebook. Gene Stone was born August 19, 1937 in Philadelphia, Pennsylvania. When he was two years old, his family moved to Yonkers, New York. Then when he was ten they moved to Los Angeles, and he still lives in southern California today. Early influences were Buddy Rich, Gene Krupa and Shelly Manne. His first professional job was in 1955 with pianist Don Randi. He worked steadily in Southern California and then in the San Francisco area. Even though the group leader, Stone, is a drummer, “Tenor Combustion” is a saxophone workout from start to finish, as the title implies. The album opens with a real burner called “Bernie’s Tune,” which was written in the early 1950’s by another virtual unknown, pianist and prolific composer Bernie Miller. This song was popularized by Gerry Mulligan and has retained its popularity over the years. In this rendition, the guys pull out all the stops and give us a wild romp from start to finish. Next, we are treated to a nice little ballad from Anne Rachel, “The Touch Of Your Lips.” This is a gentle, happy tune that (as Stewart mentions in his liner notes) drummer Stone has given a touch of Samba that keeps it moving along nicely. The Bennie Harris song “Wahoo” is up next, with an opening that could have been from just about any great tenor battle you care to name. (Harris, who died in 1975, would fit right in with this crowd, having had somewhat of a promising career in jazz during the late 1940’s and then leaving music forever.) “Wahoo” is one of those cheerful songs that will pick up your spirits if you’re feeling down and put a smile on your face if you’re already “up”. “I’ll Remember April” follows. This one is from the combined pencils of Don Raye, Gene DePaul and Patricia Johnston. It is yet another vehicle for the sax boys to show off, and they waste no time getting down to it. Stone, Glenn and Smith are more than just along for the ride, however. Smith especially tears along on his bass and the whole rhythm section sets a blistering pace. “Time After Time” is one of those Sammy Cahn-Jule Styne standards that a lot of people who don’t know jazz know because it’s damn near ubiquitous. The version we are treated to here holds no real surprises, and I don’t mean that in a demeaning sense. It’s a great song presented by five guys who were at the time at the top of their form. ‘Nuff said. Dexter Gordon’s “Bonna Rue” likewise sounds superb. Drummer/leader Stone gets a nice opportunity to show off towards the end. It’s just enough to cause one to shake their head in wonder that a talent like this remained so under-appreciated for most of his life. Skipping ahead, we come to the Sonny Rollins tune “Movin’ Out.” The song naturally lives up to its name as the guys roll along with it, no pun intended. Stone once again takes the lead momentarily toward the end. Stone chose to end the set with Charlie Parker’s “Au Privave.” For the first minute this is Glenn’s baby, then the piano gives way to both saxes for a bit, and then everyone joins in. With its vibrant energy, “Au Privave” gives “Tenor Combustion” an appropriately enthusiastic conclusion. 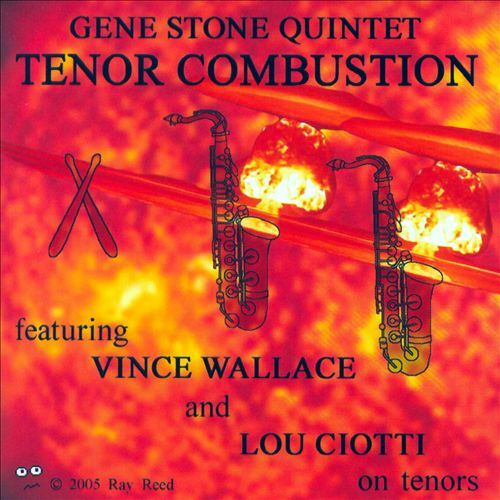 As usual, I’m sure it will come as no surprise when I tell you that I think “Tenor Combustion” from the Gene Stone quintet will make a fantastic addition to your personal playlist, for a Saturday or any other night! If you’d like to learn more about Gene Stone and his music I’m afraid you don’t have much to choose from. Neither allaboutjazz.com nor allmusic.com has any biographical info about him. Stone does have three separate pages on Facebook, but again, little information is to be found, other than the sad fact that he is presently battling cancer and undergoing chemotherapy. I’m sure he and his family would appreciate any messages of support you might care to leave. If you’d like to buy a copy of “Tenor Combustion,” it is currently still available from the record label, Rhombus Records. Also, at least two sellers have copies available on eBay. If you represent a jazz artist with an album you feel would “fit in” here, whether a new release or what I call “pre-existing jazz,” please contact me using the Leave a reply feature. Be sure to include your email address, and I will provide you with an address you can submit a review copy.